This SPB-400 aluminum lid punching and embossing machine is mainly used to convert printed or unprinted aluminum foil into little sheets. It can also convert plastic foil and paper. Yogurt lids, labels packing in food and beverage industry always use this machine. 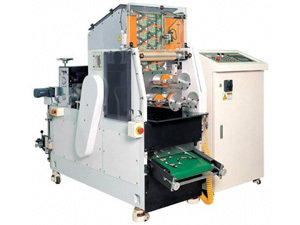 This machine can finish embossing, lid punching, lids collecting and lid counting together with high efficiency. 1. Using iron channel rack construction, with wallboards of steel plate and sheet iron panel, the cover is made from stainless steel. 2. For the unwinding roller, we uses 3" pneumatic shaft, and there is electromagnetic brake controlling the tension. 3. There is 1 set of embossing roller for the embossing part for requirement. 4. There is stepper motor that control the feeding. 5. For the punching part, it works in deflection horizontal direction and driven by main motor and the lids can be collected in pile by lid collector. 6. There is synchronous motor controlled waste collector to collect waste. 7. Regarding the control section of this aluminum lid punching and embossing machine, we adopt touch screen and separate operation box. You can setup data including length, speed, quantity, alarming, emergency stop, photo electricity tracking, count backwards stop, etc. 8. There are also transmission shaft, guide roller, and antifriction bearing for this machine. Founded in 2009, Shanghai Pripack Machinery Co., Ltd. has continually focused on providing a wide variety of laminating machine, paper coating machine, case maker for customers around the world. We are very familiar with international market of paper processing, printing and packaging and its trend of development. With high quality assurance, our case maker, laminating machine, flexographic printer are popular in markets including Ukraine, Russia period, Chile, Brazil, Argentina, Mexico, Malawi, Pakistan, South Africa, to name a few. With products of high quality assurance and CE certificated, we are sure to provide our customers with the best products at competitive price.